I used this to finely grate the ginger. It's handy for lots of other grating and zesting tasks, too. This does a great job of finely mincing garlic, and it has a built-in cleaner. This 1-quart bowl is my go-to for mixing up lots of things, including this sauce. I love having a handle to grab onto. This handy tool gets lots of use in my kitchen. It makes this sauce blend together in a flash. You can toast your own, but it is SUCH a convenience to have these toasted seeds on hand to add to Korean recipes and more! This adds essential flavor to most Korean recipes. 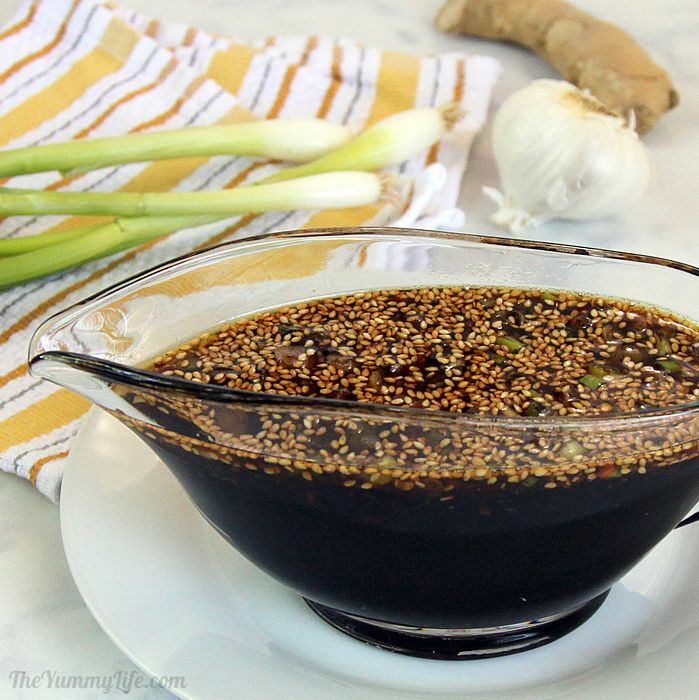 This lite soy sauce is my go-to for Korean and other Asian cooking. This adds some zip to the sauce. Use more or less, depending on how much heat you want. This is my go-to knife for chopping virtually anything. It is weighted perfectly and holds a sharp edge. I used it for quickly chopping the onions in this recipes. 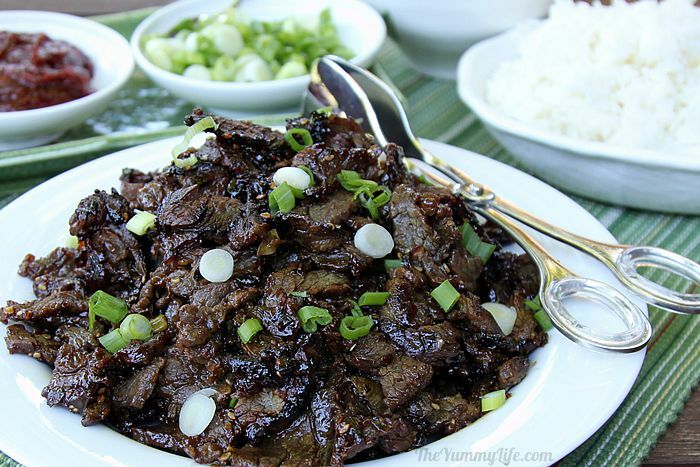 The familiar flavors of Korea in one basic, multipurpose sauce for bulgogi, marinating meats, flavoring stir fries and noodles, and drizzling on rice. In medium bowl, whisk ingredients together until sugar is dissolved. Cover and refrigerate until use. Any leftover sauce is freezable to use for future meals. Recipe inspired by instructor Naam Pruitt at the Kitchen Conservatory in St. Louis. Korean food has recently been having a surge in popularity in the U.S., and I'm completely on board with this trend. It's become one of my favorite international foods. 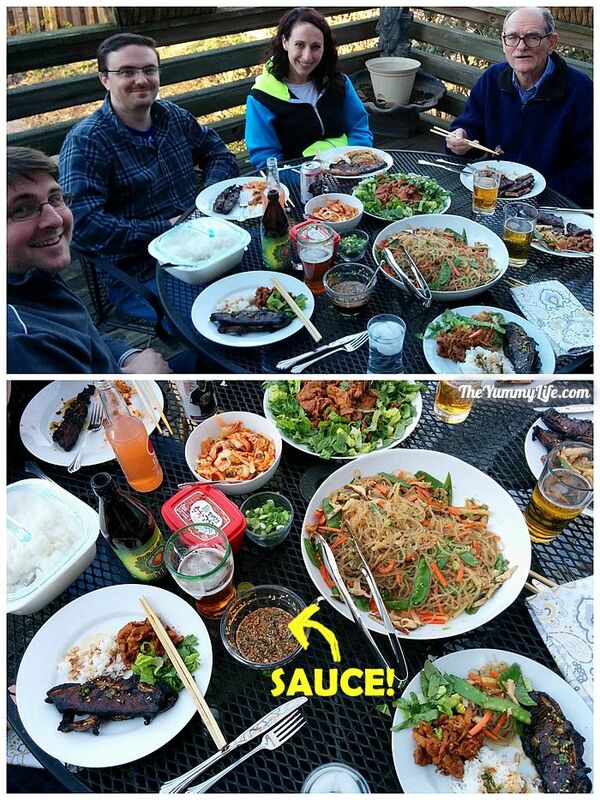 I had my first authentic Korean food a few years ago when I was visiting my son T-Man (techie guy for The Yummy Life) in San Francisco. He and his girlfriend, Shelly, took me to a neighborhood Korean restaurant where we had Bibimbap. Oh man, was it amazing. I've been on a quest to master Korean cooking ever since. Fast forward a couple of years, T-Man and Shelly had moved to St. Louis, and for my birthday they signed the 3 of us up for a Korean cooking class at our local Kitchen Conservatory. I learned to make this sauce then, along with a number of other Korean recipes that I'll be sharing in other posts. Our awesome instructor, Naam Pruitt, explained how the ingredients in various Asian foods differ. For example, cilantro is common in Thai cooking, but it's unlikely you'll find it in Korean recipes. (Ms. Pruitt is also a Thai cookbook author.) By the end of our hands-on class, I felt like I had a handle on the basics of Korean cooking as we made Korean Short Ribs, Spicy Pork, Quick Kimchi, and Glass Noodles with Vegetables. 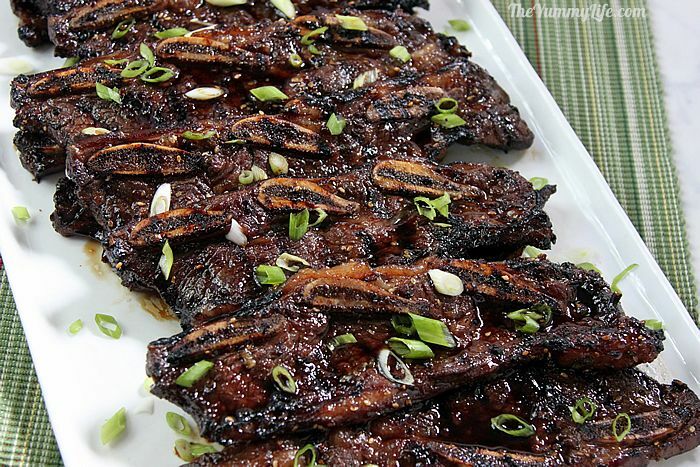 Check out the recipe I've posted for Korean Short Ribs; I'll be sharing my version of the other recipes in future posts. A short-cut sauce for almost everything. 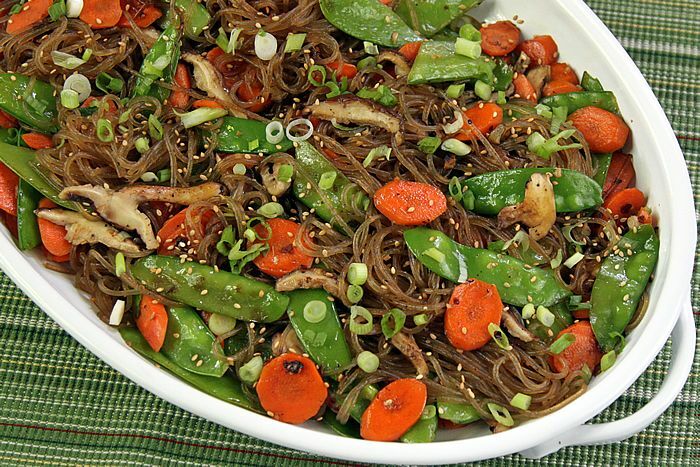 I noticed as I experimented with making different Korean recipes that many of them include a sauce with the same basic ingredients, beginning with soy sauce with the addition of most of the ingredients in the bulleted list above. So, rather than assembling essentially the same ingredients for every recipe, I make up a batch of this basic sauce and use it as a short-cut for adding flavor as I make a variety of Korean dishes. That's why I call it an "everyday" sauce--it works in almost everything. 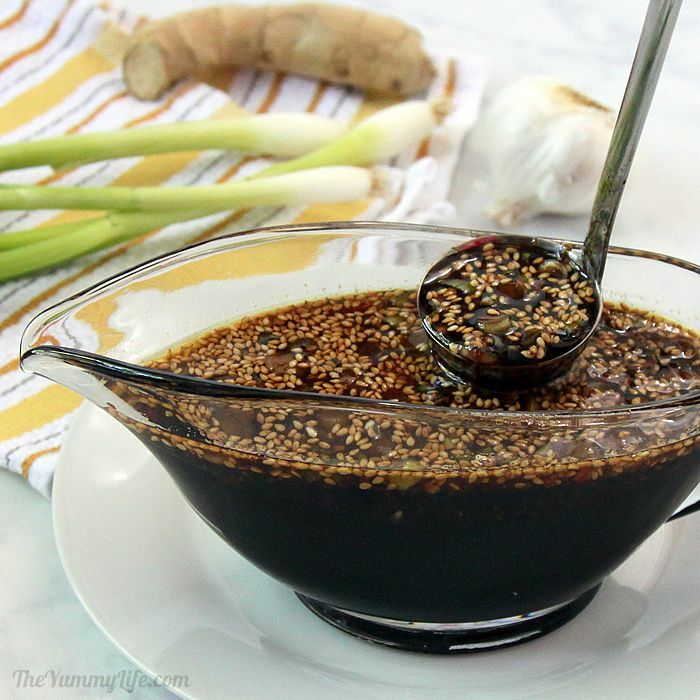 When we have a Korean meal, I always have a bowl of this sauce on the table to be drizzled over rice or to add a flavor boost to other dishes I'm serving. It is SO tasty! drizzle it on rice--SO GOOD! 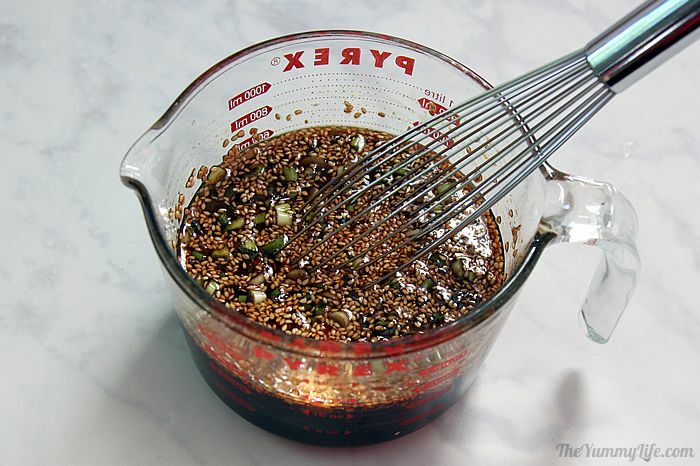 An Asian pear is an optional addition when using this sauce for a marinade for meat. 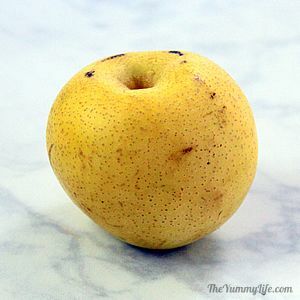 (Asian pears look like apples, but have the taste and texture of a pear; you may substitute a regular pear.) Traditional bulgogi sauce has a grated or pureed pear added to the marinade; so if you want to be authentic, add a pear to the recipe. Honestly, I usually leave it out. I can't tell a difference in the meat's flavor either way. If a pear is added, the sauce has a mushy texture and cloudy appearance making it unsuitable to be used as a condiment sauce at the table or in other recipes, so I prefer to omit the pear. 2. Peel and grate the ginger. I use a spoon to easily scrape the peel off and a microplane to finely grate the ginger. 3. Chop the onions. Use both the white and green parts. 4. Mince the garlic. Use a knife or garlic press. 5. Add all ingredients to a bowl and whisk. Keep whisking until the sugar is dissolved. Done! Easy, right? Now all that's left is adding this flavorful sauce to other Korean recipes. And, remember to include it as a condiment on the table. My family loves it most simply drizzled over rice. 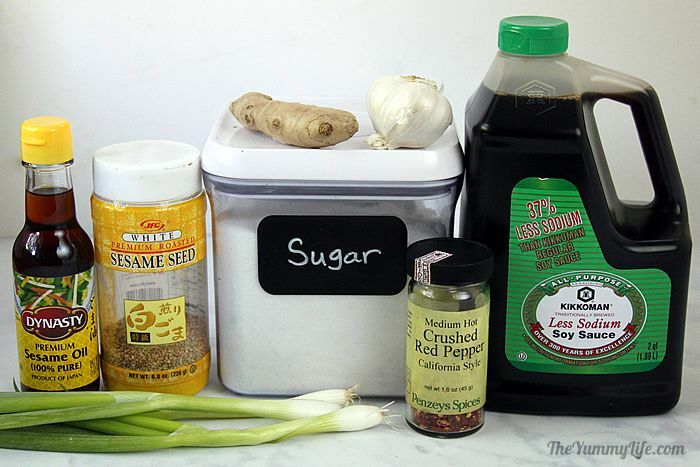 The awesome sauce is the marinade I use for Korean Short Ribs and Korean Beef Bulgogi. 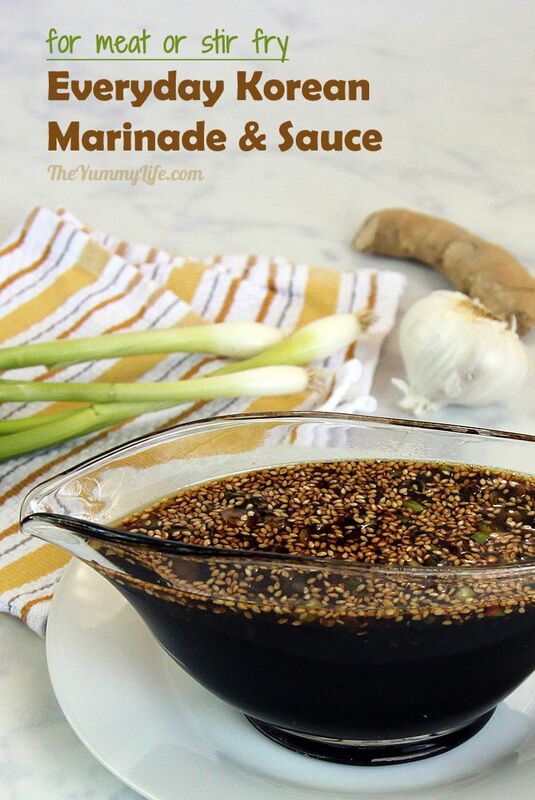 Both are amazingly delicious, yet so simple when using this marinade! Here's my family eating a Korean meal on our deck awhile back. This sauce is the first essential recipe; I'll be sharing recipes for everything else in future posts. Stay tuned for more.